We carry a wide range of hot melt adhesive carton sealing tapes. This type of packaging tape offers the widest range of application flexibility available. 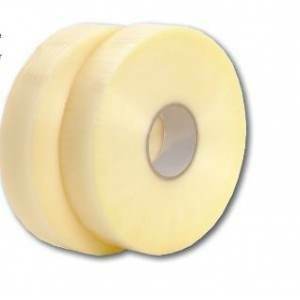 Hot melt tape offers excellent processing performance when automatically applied. The superior tensile strength, adhesion properties, and holding force of hot melt tapes will ensure consistent, reliable seals. 366804 1.41 in. 1500m Clear 1.83 mils 8 7 lbs. 59917 2" 1000 yds Clear 1.7 Mil 6 4.0 lbs.